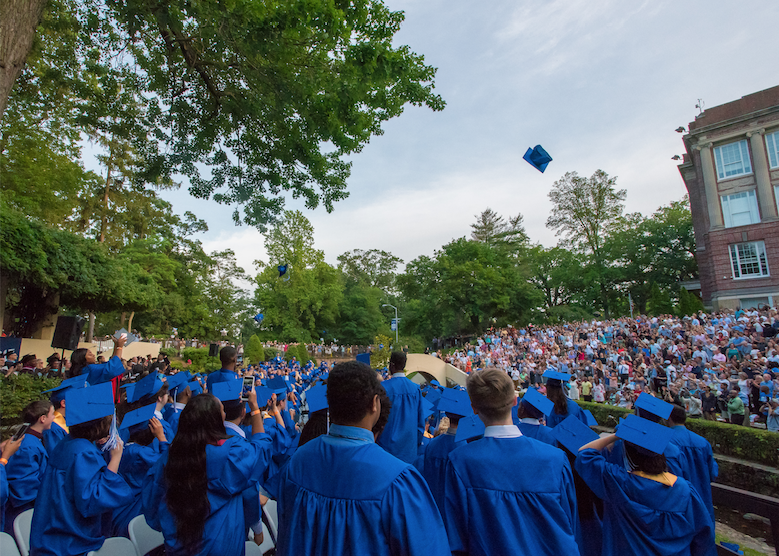 By the end of June every year, around 650 to 700 students from Montclair High School (MHS), Montclair Kimberley Academy (MKA), and Lacordaire Academy graduate from high school, and look ahead toward college. And that number does not include Montclair students who attend high schools outside of the township, such as Seton Hall Prep, Saint Peter’s Prep, Mount Saint Dominic Academy, Kent Place School, and Newark Academy. These rising college freshmen are competing with the rest of the nation–and the world–to attend the country’s top colleges and universities. And every year, MHS, MKA, Lacordaire, and these other high schools consistently send their students to top schools, some of which have acceptance rates as low as 5%. For almost every student across the United States, the college process is often the most stressful aspect of their high school careers. Whether it’s the ACTs, the SATs, the Common App, garnering teacher recommendations, or composing supplemental essays, an enormous amount of time and energy goes into landing at the right school. For many high school students and their families, the college application experience is one that is completely new and foreign and can cause strain and stress on familial relationships, or leave students without a clear plan of action. Most students can benefit from a solid plan and the right advice, outside of their high school guidance counselors. At schools like Montclair High School, such a large student body and graduating class prevent the opportunity for the one-on-one direction and input that can be crucial to the college process. If you or your high school student are in need of some instruction regarding the college planning process, there are many resources in town at your disposal. These options vary in prices, as well as methods, but are sure to provide the proper assistance. These experts make it their mission to stay up to date with the admission trends and ever-changing admissions landscape in order to provide your children with the best possible advice. The College Advocacy Center, a program within the Imani organization works with the Montclair High School guidance department in order to help students with every step of the process, whether it’s finding a school to best fit the student, discussing how to pay for a college education, helping to find scholarships, and to assist with essay questions. These services are of no cost to Montclair High School students and their families. The Essay House specializes in the writing aspect of the college process. The coaches walk their students through the writing process, helping them to answer the classic application questions through jump-start workshops and one-on-one coaching. The coaches at Essay House, Meg Siesfeld, Karen Vrotsos, and Jessica Wolf, all Montclair mothers, work to help their students to find their own unique stories and writing styles in order to distinguish themselves among the crowd of applicants. At College Apps Made Easy, Corinne Connor uses her experience as a mother involved in the Montclair school district to benefit the next generation of college students. Corinne helps her students to find the perfect college for them by creating a personalized assistance package, unique to each student and their specific needs. In addition, Corinne is also an essay coach and mentor with the Imani College Advocacy Center. College Help! Organization and Advising Services works with students and parents to organize your personal college process. Barbara Gottesman (Barbara@nostresscollegehelp.com) uses her years of experience and advice in order to create the best college list and set expectations for her students in order to help take away unwanted and unneeded pressure. After an initial meeting, Barbara then works with her clients as little or as much as they see fit. The application process is rarely easy or stress-free, even for the most organized of high school students. With a little extra help, in whichever area one might need, outside guidance and resources could put students are their own unique track.